Much has been said about the shale (oil and gas) revolution, but according to Christof Rühl, Group Chief Economist and Vice-President of BP, its real implications have yet to sink in. He points out, for example, that no detailed assessment has been made yet of its macro-economic impacts. In this wide-ranging analysis, Rühl – one of the world’s most influential energy economists – discusses some of the major implications of shale. He notes that as a result of shale development, decisions in the oil and gas market will increasingly move from the global geopolitical level to town halls and parliaments. And he raises the question of whether the climate is better served by developing more shale gas than by the build-up of renewables alone. In a previous article, I addressed some of the reasons for why the shale oil and gas “revolution” happened in the US and Canada, and not elsewhere, in countries with equally ample resources. The short explanation was – it is all about competition. Innovation is involved in unlocking these resources, and so it will take time to bring them to market in countries that lock themselves out of the free flow of investment and ideas, or that do not allow for competition at home. The large scale commercial production of oil and natural gas from shale itself may be new, but there is nothing new about this principle in the history of our industry – or, if one thinks about it, the history of any industry. Meanwhile, production in North America keeps rising. And shale is changing the broader landscape: No one doubts anymore that the country will become a natural gas exporter in the not-so-distant future. Total oil imports have been cut by almost half. With crude exports still legally constrained, the US now reaps the benefits of cheaper domestic crude by exporting refined products instead: The country has switched from net imports of 2 million barrels per day (Mb/d) of refined products as recently as 2007 to net exports of 1.2 Mb/d most recently. Not only is energy security benefitting: of all the countries in the world, the US last year had the biggest increase in oil as well as gas production – it also had by far the largest decline in CO2 emissions, courtesy of the unprecedented replacement of coal with natural gas in power generation, enabled by shale gas. (Natural gas fired power generation has about half the emissions of coal fired generation). Small wonder that the “shale revolution”, or unconventional oil and gas in North America more broadly, is slowly becoming recognized as consequential beyond this region, beyond energy markets, and for years to come. And yet, the assessment of global strategic implications – for energy security, geopolitics, the global economy, or for the environment – is still trailing actual developments; and perhaps unsurprisingly so, given the uncertainty around future production growth. What are some of these likely strategic, global implications? To discuss this, one needs a sensible benchmark. There are two aspects that make shale resources different from conventional oil. First, they appear to be widely distributed across regions. Assessments are still in their infancy, but all available tallies show technically recoverable oil and gas shale resources spread across Asia, Australia, Africa, South America, Europe and Eurasia – closer to consumption centres than conventional oil. Mind you, we know preciously little about the economic recoverability of these resources. Second, most forecasters – ourselves included – predict production growth to remain concentrated in North America for the foreseeable future, despite the relatively even spatial distribution. 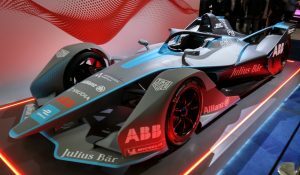 The reasons are the lack of access, competition and thus innovative fire-power in other countries; and, related, a lack of infrastructure, which will take time to build. The figure above illustrates both points. 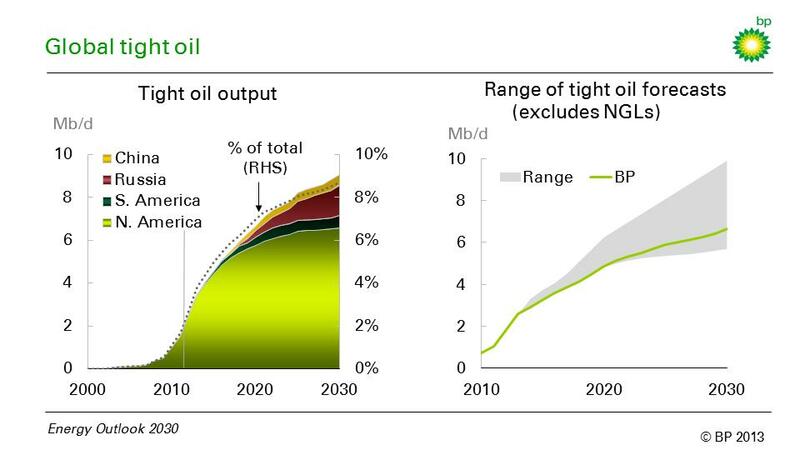 The left hand side shows a production profile, taken from BP’s Energy Outlook 2030, published in January 2013. Based on our view of geology, infrastructure requirements, drilling activity as well as the speed with which shale resources are likely to be accessed in various locations, it shows global production from shale oil rising to about 9% of global oil production by 2030 – from virtually nothing just a few years ago. Three characteristics are worth mentioning: (a) Production growth continues to be driven by North America; (b) growth will remain positive but slow down after about 2020 from the very high rates today; and (c), other countries will enter the game – notably Russia, China, Argentina and Columbia – but their contribution will not grow fast enough to reverse the general pattern of slower growth after 2020. Next, we compared this freshly minted forecast to those of others, shown by the shaded areas on the right hand side of the figure above. It turns out (and at the time came as a surprise to us) that BP’s forecast is conservative indeed. It lies at the very low end of the range of all other forecasts. In fact, we had trouble finding lower estimates. Our forecast is not only lower; the slowdown of global tight oil growth after 2020 is also not widely shared. Many others predict steady growth, or even an acceleration out to 2030. The conservative nature of this forecast matters. Obviously, given the current range of uncertainty, any discussion of global implications is – explicitly or not – based on a production outlook. Ours implies that the consequences discussed below have to be amplified, should the more optimistic predictions have it right. So what are these implications? Based on this conservative benchmark, I can think of at least five. One of the first questions raised by the shale “revolution” will be about the impact of rising shale oil (and gas) production on markets and prices. Let’s concentrate on oil. In a normal market, prices should fall and the only issue for an economist would be to calculate how fast and by how much. But the oil market is not exactly ‘normal’: It features a producer cartel with a long history of trying to manage prices and production. 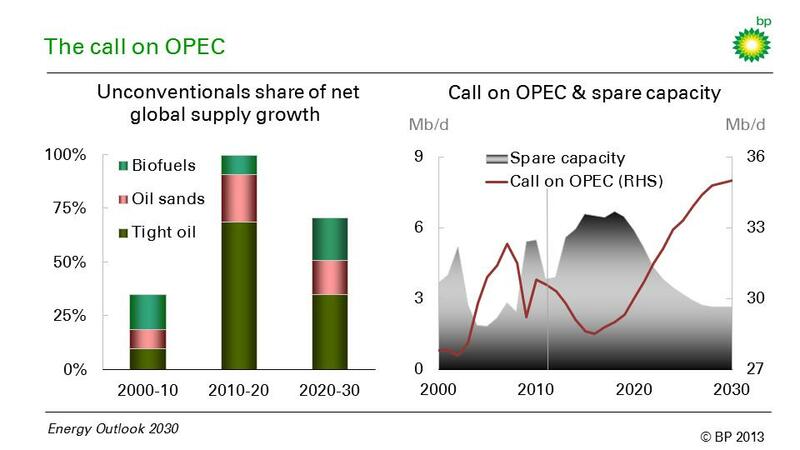 In oil markets, the question of the consequences of higher (shale) oil supplies seamlessly translates into the question of how OPEC is likely to react. There are good reasons to presume that OPEC members are willing and capable to react with production cuts to rising non-OPEC supplies. Production cuts, in turn, lead to spare capacity. The build-up of spare capacity in OPEC countries required to neutralize the additional supplies (including biofuels and oil sand production) is substantial indeed: Taking our conservative production profile as a guide, spare capacity to accommodate the new supplies will have to exceed 6 million barrels per day (Mb/d) within this decade – the highest since the late 1980s, as shown on the right hand chart below. This will be no easy task for OPEC. The cohesion of the organisation is the key uncertainty, especially in the current decade. It will be a world in which Russia, the US and Saudi Arabia account for a third of global production. Of the three, only OPEC member Saudi Arabia is likely to incur the cost of maintaining large amounts of spare production capacity. And Saudi Arabia is situated between Iraq, an OPEC member with steadily rising output but without a quota agreement, and Iran, for which no one can predict how long the current sanctions will limit production. The role of “above ground” political discussions is likely to reach new heights in determining whether, where and when shale resources will be accessed. On the other hand, we are unlikely to witness the return of the very low oil prices last seen in the 1990 or 1980s (assuming OPEC stays put). Tight oil production is not only relatively expensive; with its high well density, it is also eminently scalable (different from the conventional supplies in Alaska or the North Sea added in the 1980s). Supplies will react if prices fall substantially. In the first instance, the advent of shale oil (and gas) is likely to put pressure on prices by stressing the configuration of markets as we know them. In the case of oil, OPEC is the lynch pin of these markets. In the case of gas, it is the oil indexation of gas prices. Our industry is fond of distinguishing “above ground” from “below ground” factors when debating resource access. Below ground is geology, circumstances inherited from nature; above ground lure man-made conditions, such as the political, legal or economic framework. The role of “above ground” political discussions is likely to reach new heights in determining whether, where and when shale resources will be accessed. These debates will evolve around local, as opposed to big geopolitical, concerns – simply as a corollary of the widespread geographic distribution of shale resources. The flukes of nature that distributed sizeable ‘conventional’ oil resources millions of years ago have distributed them in a highly concentrated fashion. Traditional politics of oil and gas are consequently, more often than not, reduced to the simple issue of who effectively controls these sweet spots, few and far between as they are. In the matter of tight oil and shale gas, in contrast, local debates will come to the fore, dominated by local attitudes toward energy, competition and environmental policies – all this in turn reflecting the interplay between the relatively even spatial distribution of shale resources and the role of free entry, competition and – and not least – environmental concerns in accessing them. The signs are everywhere already. In Europe, Poland and the Ukraine are aggressively competing for investment whereas France and Bulgaria have put moratoria on fracking in place, removing shale prospects for the time being. Germany and the UK are debating. 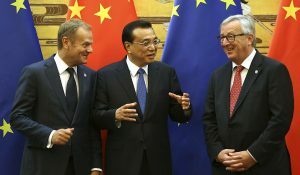 China’s lack of success to date in accessing shale gas as planned is largely due to the preferential allocation of prospective areas to national monopolists, with high barriers to entry for everyone else – including companies with better technologies or less risk aversion, be they domestic or foreign. Russia faces an interesting trade-off between pursuing entirely new and high cost technologies to shift production into the concentrated resources of the Arctic, or of allowing a little more of the trial and error necessary to explore technology to access it’s well known shale plays. Albeit hesitantly, it is reforming its tax sector in pursuit of the second option. 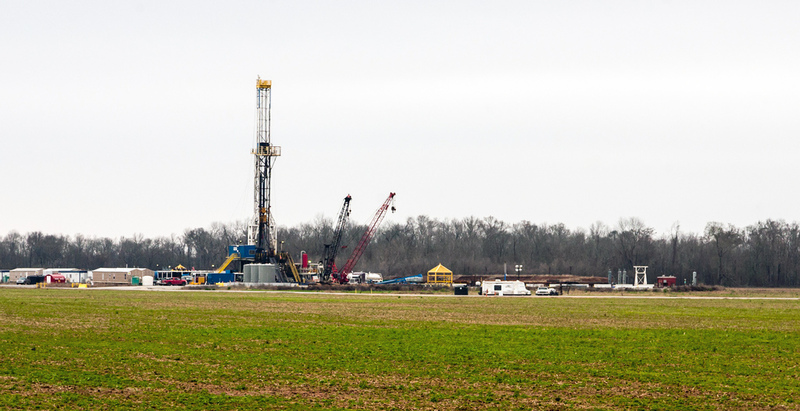 Even in the US, production from shale formations so far has remained concentrated in the middle of the country, leaving large known fields in the coastal areas of California and New York State untapped, in this case because of environmental concerns. Implausible as it may sound, twenty years ago, China was a net exporter of energy. All these examples reflect above ground, political discussions. They mirror local attitudes towards free access, competitive energy markets, and the environment. We should expect more of the same. Increasingly, decisions determining whether and how these resources are brought to market will be made in consumer’s own town halls and parliaments – not by ‘big’ geopolitics mirroring the capricious design of nature in allocating conventional oil endowments in faraway places. Having to make local decisions does not mean that the geopolitics of energy become less important. In fact, the third implication has been most widely recognized: It concerns the geopolitical consequences of shifts in the established centres of production and consumption. Nowhere is this better exemplified than by looking at the role of the Middle East. We all have grown up in a world in which oil is the central fuel, and the Middle East is the world’s central oil supplier. For better or worse, the ensuing relations between the world’s largest oil consumer and this regional supply centre always had huge political consequences: there is no denying that a special two-way relationship has developed over time between the US (and the OECD more broadly) and small Middle Eastern economies which happen to be large oil producers. These relations may be about to change, and in rather unpredictable ways. Implausible as it may sound, twenty years ago, China was a net exporter of energy. 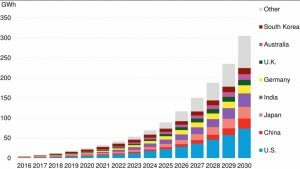 By 2030 it is likely to become the world’s single largest oil (and natural gas, and coal) importer, relying on imports for almost 80% of its oil and more than 40% of its gas. 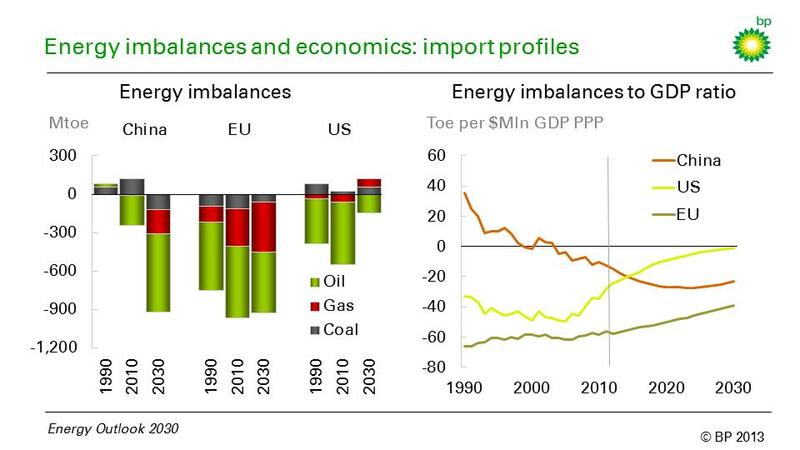 Europe, over the same period, is likely to remain a large importer of fossil fuels – this is shown in the left hand chart below. The US faces different prospects. Taking again the conservative production profile as our guide, the country will be nearly self-sufficient in energy by 2030. North America as a region (Mexico, the US and Canada) is likely to achieve this landmark even earlier. The US is a net coal exporter already and there is little doubt that it will become a net natural gas exporter soon. And while, in our conservative profile, it will remain a net importer of oil by 2030, these imports will have fallen drastically. What are the consequences? Is it conceivable (and this is most definitely not a prediction) that a future American administration looks at this troubled region, wondering whether this is really skin of their nose because they need only very little oil – and the little they need, they can get from Canada and Mexico? We cannot know. The point is, it is unpredictable. What is clear is that nature, markets, and presumably politics are not known to be fond of a vacuum. We cannot know how this one will be filled. But the geopolitics of energy relations as we have known them, are shifting. So far, the public discourse around the economic implications of shale oil and gas is dominated by the question whether cheaper energy prices will give the US a competitive advantage and may even trigger its industrial revival. In the grand scheme of things, this will turn out to be a peripheral issue. More important are the global capital flows associated with the new production centres of oil and gas. In case you asked, most economists over the last few years would have probably answered that one of the most persistent threats to global economic stability lies in what has come to be known as global imbalances: The term refers (mostly) to the need to finance a persistent US external and public sector deficit with capital inflows from countries that have an external surplus. The most prominent example, of course, is China. But the US also imports capital from the Middle East and other export oriented economies. The risk associated with this situation is that rolling over these financing requirements may eventually prove unsustainable. Global instability could result. The energy imbalances discussed yesterday carry the potential to alleviate these Balance of Payment imbalances. Today, energy imports still account for ~50% of the external US deficit in goods and services. At first sight, the trend toward self-sufficiency in energy will diminish this deficit (it will also help the fiscal situation). By the same token, rising energy imports will lower the Chinese trade surplus. Should lower oil prices materialize, this would leave a dent in the current account surplus of Middle Eastern oil producers as well. Think of the sheer order of magnitude. Gas and coal account for about a quarter and a third of global energy consumption, respectively; renewables (without hydro) for a little more than 2%. 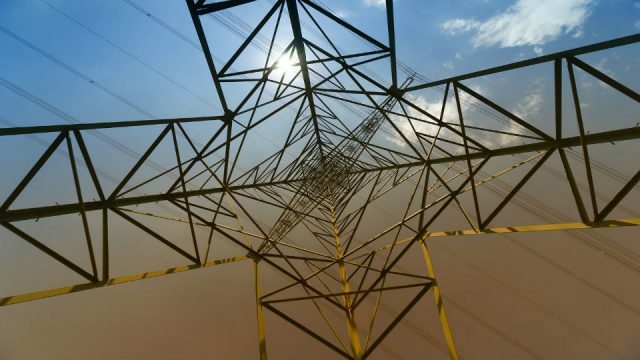 All of a sudden, a force for good seems to have emerged and from an unexpected angle – from energy markets, going some way to support a rebalancing of the global economy. One has to be careful, of course. The US could decide to import more of something else instead of energy. Complicated exchange rate effects will have to be evaluated before contingent conclusions can be drawn. As of today, no one has drawn up such a detailed assessment of the macroeconomic impact of shale oil and gas. One point is obvious, however. Even under our moderate production profile, the scale of this global impact promises to be huge – large enough to make such an assessment urgent. In the end, it seems a fair bet that the Balance of Payment effect will dwarf the current dispute about energy prices and US competitiveness. Generating a kilowatt-hour of electricity with a modern gas fired power plant leaves about 50% less carbon emissions in the atmosphere than doing the same with coal fired generation. The consequences are stark. Last year the US, not known for conscious climate policy, not only had the world’s largest increase in oil and gas production, but also recorded the largest decline in CO2 emissions worldwide – because of a massive displacement of coal in power generation with cheaper shale gas. In the EU, in contrast, carbon emissions fell only marginally and only as a result of the economic recession – as shown in the chart below. Carbon intensity – the amount of carbon emitted per unit of energy – rose, as Europe’s economies replaced gas in power generation with cheaper coal, imported from the US. US coal is being chased into exile by the shale “revolution”: Replaced by cheaper shale gas at home, coal is shipped to Europe, where it replaces more expensive liquefied gas imports in power generation. The foregone gas imports, in turn, move into Asia, where they are wanted at premium prices – among other uses, to substitute for the lack of nuclear power in Japan (you may remember reading about this phenomenon in a previous blog). In this way, European power generation is creating an unfortunate mirror image of the US: In Europe, the share of coal rises and the share of gas declines; in the US, the other way round. 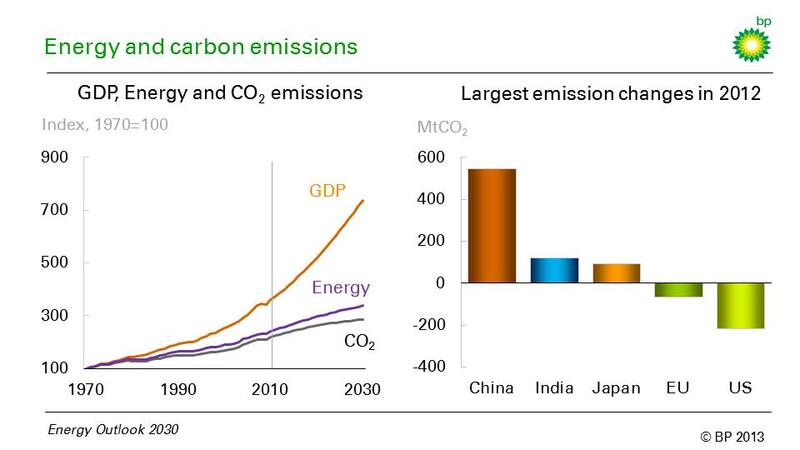 The consequences for carbon emissions are obvious. Think of the sheer order of magnitude. Gas and coal account for about a quarter and a third of global energy consumption, respectively; renewables (without hydro) for a little more than 2%. Inescapably, this leads to the question whether CO2 targets are better served by advocating more global substitution from coal to natural gas, including shale gas, rather than by the gradual and expensive build-up of renewables alone. 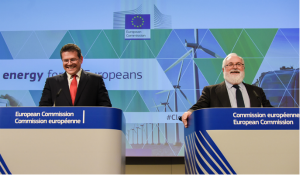 The argument to make better use of scale and global trade – for example by taking carbon pricing seriously – is strengthened by the efficiency with which the two fossil fuels are traded across borders and even continents, something not yet possible with the wind and the sun. And so the question arises – what is it going to be, fear of fracking or the conscious advocacy of replacing more coal with natural gas on a global scale, including shale resources? I have my own guess on that one. Fracking is a local problem, carbon emissions are abstract and global. We know how these things tend to end. But for now the point is only that, in much of the environmental debate, the question isn’t even asked. This concludes the piece on the global implications of shale. Keep in mind, this was based on the – by now – old Energy Outlook, published in January 2013. But it also was done in preparation of its successor, due January 2014, for which you can now sign up for the webcast on January 15th. 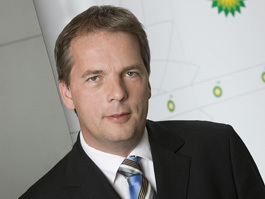 Christof Rühl is Group Chief Economist and Vice President of BP plc. He manages BP’s global Economics Team, providing economic input into the firm’s commercial decisions. BP’s Economics Team produces the annual Statistical Review of World Energy and the Global Energy Outlook. Prior to joining BP, Rühl worked at the World Bank (1998-2005) where he served as the Bank’s Chief Economist in Russia and in Brazil. Before that, he worked in the Office of the Chief Economist at the EBRD (Economic Bank for Reconstruction and Development) in London. He started his career as an academic economist, first in Germany and from 1991 as Professor of Economics at the University of California in Los Angeles. It is published here with permission from the author. I grew up in Louisiana and now live in Hamburg, Germany, where I moved after being evicted from an eastern German village (www.heuersdorf.de) that was destroyed for mining CO2-intensive lignite. This combination of experiences has confirmed particular discrepancies between idealized national aspirations and global market realities. A decade ago, Germany billed itself the world’s climate champion, but it is now using coal and lignite to compensate for nuclear phase-out. Imported natural gas costs six times as much as lignite on a thermal basis, making it economically unfeasible to achieve CO2 reduction by fuel switching. Yet Germany does have one prerequisite favorable to shale gas extraction: The Mining Act, essential provisions of which date back to 1937 when Hitler expropriated domestic geological resources in preparation for World War II. The same law has now provided the legal basis for granting ExxonMobil preliminary shale gas exploration rights for a 150 square kilometer area within the city limits of Hamburg. A comparable situation would be for New York City to relegate the Bronx to fracking. What could appear irrational in the United States with its bounteous energy reserves may be considered plausible by the European Union for confronting import dependency. I have delivered more than a half-dozen presentations on shale gas exploitation to concerned Hamburg citizens, who contrary to the inhabitants of German lignite regions have never brushed shoulders with the mining industry. Yet the same regulations inherited from the Third Reich might now be used to divest them. In contrast to Louisiana, however, expanding the local infrastructure to sustain gas extraction would be an inordinately disruptive venture. The remaining temptations of European fracking reflect the hope of emulating US market developments, in which 20 percent shale gas injected into natural gas pipelines has reduced the Henry Hub price from 12 to 4 dollars. All hitherto experience with the German energy transition (Energiewende), however, indicates that the reverse process could ensue here, since generation surpluses from coal, lignite, and renewable energies have already driven electricity prices to the highest levels in the world. Wherever the laws of supply and demand are subordinated to political expediencies, anything can happen. Hi, I was under the impression that in-situ energy extraction from coal beds was now technically and economically viable. Is that being considered in Germany at all, and if so do you think it would be a useful alternative to the actual mining of lignite? What a valuable assessment this is. It will be interesting to see what has changed when the 2014 BP report comes out next week. I know when I read the last one it shifted my thinking about global energy radically, particularly the effect the USA was having at home and abroad. The huge drop in American generated CO2 thanks to gas does put into perspective the rather futile measures such as curly light bulbs when trying to reduce man made CO2. I had the chance to receive from few friends a Study released in 2011 by the Cornell University, Ithaca-NY/USA titled: “Methane and GHG footprint of natural gas from Shale formation” which is worth reading and that could be found from the web. On basis of it, it is important to evaluate the amount of “Methane Fugitive Emissions” just due to the Shale-Gas drilling and extraction from wells. Moreover, the Study is putting in evidence another important element: the conversion factor of CH4 vs. CO2 in term of GWP (Global Warming Potential), very different from the one published in the past and so far by the scientists of the UN-IPCC. Could you kindly inform us a little more on this, please ? I wondered about the viability of in-situ lignite gasification myself as the excavators closed in on Heuersdorf several years ago. Shale gas extraction was in its infancy at that time, while global coal demand and prices were rising dramatically. Germany has vast hard coal resources at depths too impractical to mine by conventional means. 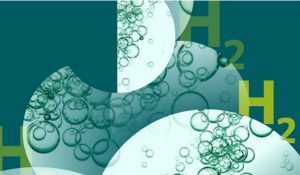 Research was underway at the Rhenish-Westphalian Technical University (RWTH) in Aachen to investigate in-situ gasification as an alternative to increasingly expensive coal imports. When coal prices subsequently collapsed, however, the program website (www.co2sinus.org) was shut down. For this reason, German lignite is among the least expensive fossil fuels worldwide at 4 – 5 euro/MWh. Mine-mouth power plants make rail transport superfluous. The price of North American natural gas converts to about 10 euro/MWh. The spot price for natural gas in Germany is currently 27 euro/MWh (http://www.eex.com/en/). A German newspaper recently wrote that CO2 trading prices would have to rise 14-fold for gas generation to be competitive with lignite. Even such a development would not automatically lead to a renaissance of gas power unless ETS prices could be permanently stabilized at the required level. In answer to Jason’s rhetorical comments ‘So the essence of this story is ‘BP vice president says fracking is a good idea’. Well I never’- at least the BP Vice president knows what he is talking about and back it with evidence! I found the piece thoughtful and a debate-stimulating example of analytic thinking. We need to understand both the pros and cons of oil and gas production by fracking so that local decisions can be well informed. I think you are wrong to assume that OPEC can maintain oil price by reducing output. Initially, this may be their reaction, but that will drive populations outwith OPEC to seek cheaper sources. With a majority, it seems, of countries having at least some shale gas/shale oil resources, it will not be a seller’s market . Then we have OPEC internal pressures ( nobody wants to see their standard of living decrease) and to voluntarily do so, just to keep oil price up, for no real reason when the world is deserting oil, and no guarantee that they will be back, would not find much favour amongst the populations of OPEC. If predictions are correct, then the world is on the verge of a ‘glut’ of shale gas and shale oil. Moreover, the public (since the House of Lords Report into Shale) are becomming aware that gas prices have been pegged to oil prices by the oil cartels . Japan has already severed this link, one would suspect that other nations will follow suit, if the oil companies see the writing on the wall and do it themselves. What is sad though, is that there appears to be no plan for Shale oil and gas. When the UK first discovered oil, and gas, in the North Sea, it was like a child in a sweetshop. No thought was giving to the future when the oil ran out, and we are faced now with a scramble for alternatives and a very high cost for imported gas. Perhaps, this time, a little more forethought could be given to the future when, when even Shale is exhausted. If some profits were set aside, from the beginning, from Shale. Then, year by year, we could be building more and more renewable energy sources.